The white-fleshed sweet potato (boniato) is as versatile as traditional American potatoes. In the Caribbean, there is a huge variety of sweet potatoes and people are always finding different ways to use them. Often, they are substituted for regular potatoes. In an effort to serve a different kind of mashed potato dish. 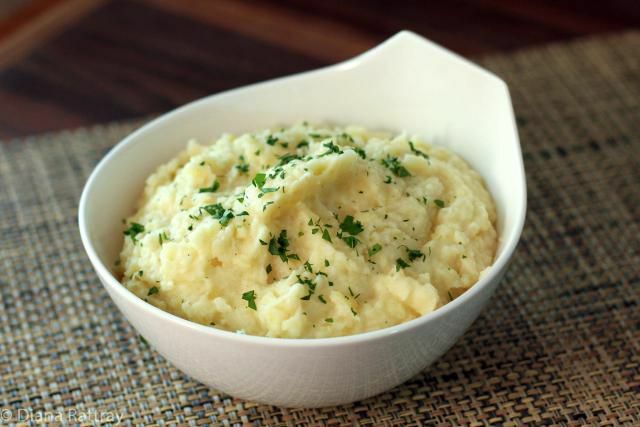 the white-flesh sweet potatoes were used to make this spiced mashed potato dish. Serve this just as you would regular mashed potatoes. It should go great with pork, chicken, and other protein main courses. The boniato is native to the Americas and its name means "harmless" in Spanish, probably to distinguish it from poisonous plants. It grows year-round in the Caribbean. It has a purple skin and white flesh that isn't as sweet as other varieties of sweet potatoes. It is high in vitamins A and C and in fiber, making it hearty and healthy. There are also many varieties of spicy chili peppers native to the Caribbean, including the Scotch bonnet, Caribbean red peppers, and Trinidad scorpion peppers that make the hottest of the hot lists. You can add milder chili pepper, of course, and adjust the amount to taste or leave it out if you wish. Peel the sweet potatoes and cut them into large pieces. In a large pot, place the potatoes, cover with water, and bring the pot to a boil over high heat. When the pot comes to a boil, salt the water and let the sweet potatoes cook until a knife inserts easily into them. Drain the sweet potatoes thoroughly. Add the drained potatoes back into the still-hot pot along with the salt, butter, pepper, and milk. Mash the potatoes until they are smooth. Season with the hot pepper. Mix well. Your mashed white sweet potatoes can be part of a Caribbean feast or family dinner. A baked or roasted chicken breast with Caribbean jerk seasoning would be a good accompaniment, as would pork chops. Store any leftover mashed sweet potatoes in the refrigerator for up to five days before using. Or, you can freeze the cooked mashed sweet potatoes for up to a year. They are easy to reheat in the microwave. Besides enjoying them again as mashed potatoes, you can use them in a variety of ways. Top a shepherd's pie made with meat, vegetables, or lentils with the leftovers. You can also form them into potato patties adding vegetables, flour, and egg (or egg replacer) and fry them to make a great breakfast dish or appetizer to serve with dip or chutney.